Tiger Beer, widely known as an iconic Singaporean beer, has rolled out its own satay-flavoured potato chips. The chips, exclusively available in Singapore, will be given as a free gift for every 10 pack of Tiger Beer purchase. 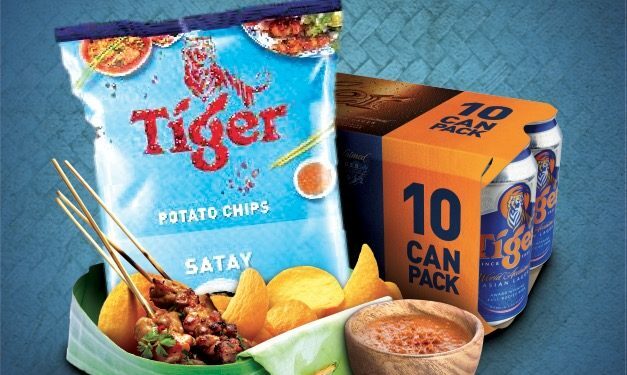 Speaking to Marketing, an Asia Pacific Breweries Singapore spokesperson said that drawing inspiration from local food, the satay flavoured chips were created in a bid to complement to the taste of Tiger beer. However, the brand will not be actively promoting the product through ads or campaigns run for this promotion. The 10 pack Tiger beer can be purchased through Redmart as well as participating supermarkets and online retailers such as Cold Storage, FairPrice and NTUC FairPrice, Giant, Lazada, Prime and Sheng Siong. The promotion will run from 1 October to 1 November 2018. “Tiger Beer has always been committed to championing Singapore’s local street food heritage, which is why we’ve taken all the mouth-watering flavours of the iconic satay, and infused them into the classic potato chip – a delicious snack that complements the refreshing taste of Tiger Beer. The satay-flavoured chips is a Tiger invention that not only celebrates local, but brings together all the flavours we know and love,” Faye Wee, marketing director of Asia Pacific Breweries Singapore said. Most recently, Tiger moved its creative account from Marcel Sydney to Publicis Singapore. The account will be relocated within Publicis Groupe to a newly created, dedicated team in Singapore, made up of diverse talents from within Publicis Communications including Arcade and Digitas. Khairudin Rahim will be retiring from his position as chairman of Lowe, leaving Mazuin Zin to head the agency as managing director.. TeaM MADLEETS has hacked Google’s homepage (google.com.my), redirecting the page to another website. The incident happened earlier..